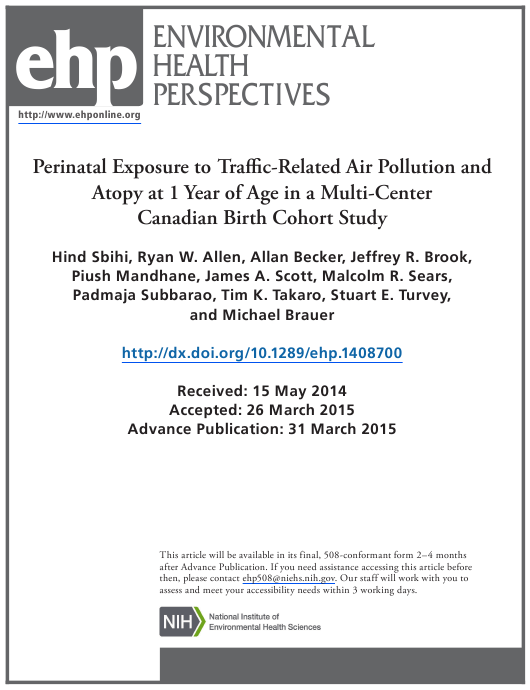 This "Perinatal Exposure to Traffic-Related Air Pollution and Atopy at 1 Year of Age in a Multi-Center Canadian Birth Cohort Study" is a part of the paperwork released by the U.S. Department of Health and Human Services - National Institutes of Health specifically for United States residents. The latest fillable version of the document was released on May 15, 2014 and can be downloaded through the link below or found through the department's forms library. assess and meet your accessibility needs within 3 working days. Group. Thank you to all participating families. (CIHR) and the Allergy, Genes and Environment (AllerGen) Network of Centres of Excellence. endowed Chair in Respiratory Epidemiology. Competing financial interests: All authors declare no competing financial interests. ongoing national birth cohort study in four Canadian cities. daycare attendance, and modeled home ventilation. (aOR = 1.17; 95% CI: 0.95, 1.47) and inhalant allergens aOR = 1.28; 95% CI: 0.93, 1.76). (Gruzieva et al. 2012; Janssen et al. 2003; Brauer et al. 2007; Morgenstern et al. 2008). However, a number of other studies have not observed these positive associations (Gehring et al. possible explanation for these divergent findings. assessment methods have evolved from self-reported measures (e.g. proximity) (Janssen et al. are highly variable in time and space (Mölter et al.